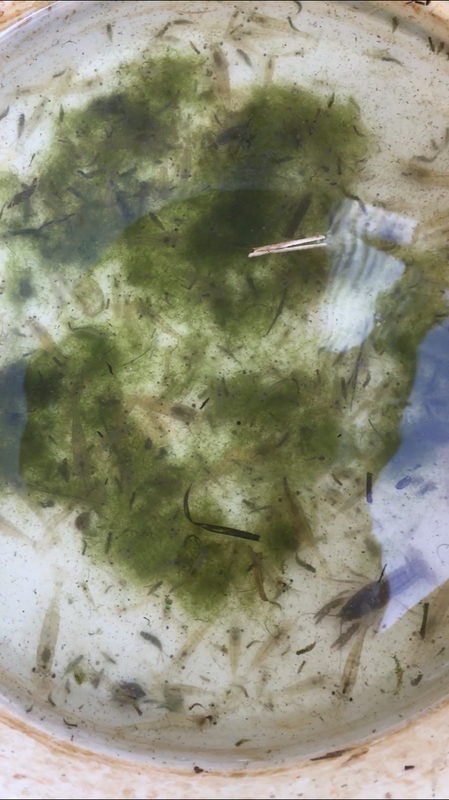 In May of 2018, we stocked a two-acre pond in middle Tennessee with the aforementioned P. kadiakensis shrimp. The landowner’s stated goal for the pond was to grow trophy bluegill. The pond had some filamentous algae growing around the edges of the pond, and I told the landowner that the shrimp should do well as a result of the plants. Fast forward to a couple weeks ago, when I got an e-mail from the landowner saying he had decided to see if he could find any shrimp in the pond. He pulled handfuls of the FA from two different spots in the pond and put them in a five-gallon bucket. He found that each handful of FA averaged thirty to forty shrimp, and was also full of mayfly larvae; there was also a crayfish that had made his way into the pond. Bluegill have been found to grow over twice as fast in ponds with grass shrimp as those without. We’ve had coppernose bluegill reach ten inches in fifteen months from being stocked as 1-2″ fingerlings in a pond that wasn’t stocked with grass shrimp. We’ll be stocking this pond with coppernose sometime in the next month. Just imagine what those coppernose will look like a year from now.